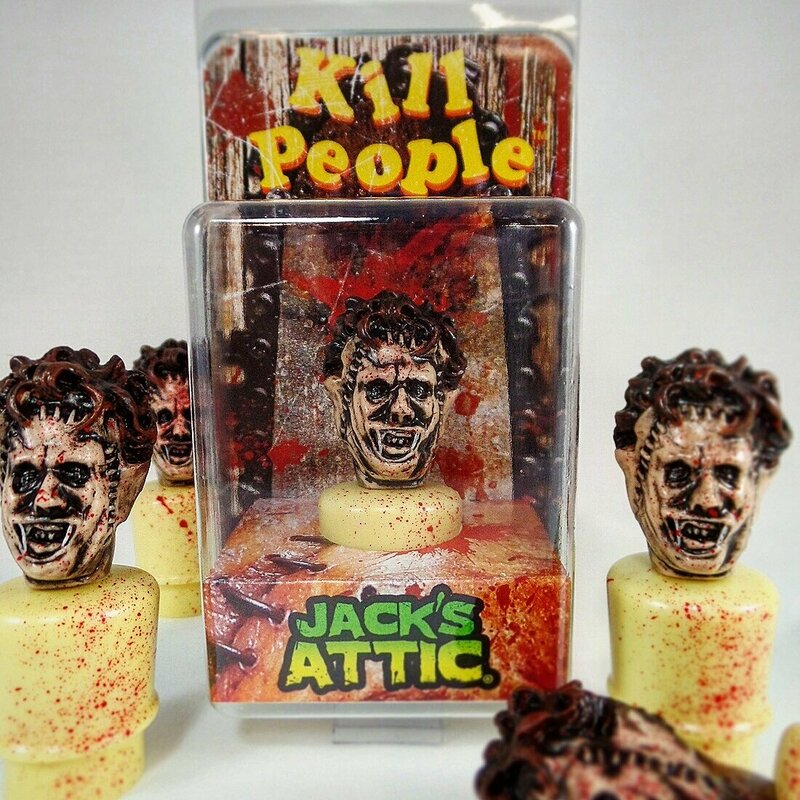 Jack’s Attic Releasing New ‘Leatherface’ Bootleg Resin Figures On August 19th! One of my favorite resin horror-themed artists is Jack’s Attic, and easily one of my favorite purchases from him was his ‘Friday The 13th‘ video vame resin figure (fully attached to a mock-up Nintendo cartridge for added effect). And next Friday, August 19th, he will be releasing his newest figure ‘Headcheese’ in multiple variants! I love the packaging he does for his figures. Each one of the ‘Headcheese’ variants will be limited (some more than others) and it has been announced that there will be a glow-in-the-dark version, as well as a version dedicated to the Texas Chainsaw Massacre Atari video game! The latter I’m most excited about. Oh – how could I forget the variant modeled after the old M.U.S.C.L.E. toys? Bottom line – you will have many to choose from, but choose fast because they won’t be around long. The sale date is August 19th at 12:30 EST. Go to Jack’s Attic’s page HERE for more info. Before Peter Jackson was doing some crap called the Lord Of The Rings Trilogy, he was making what quite possibly the bloodiest, goriest, most enjoyable horror/comedy ever called Dead Alive a.k.a. Braindead in 1992. But even before that, he had a bad taste in his mouth in 1987. And that bad taste was a sci-fi/horror/action/comedy hybrid called…..Bad Taste! I still don’t know what the hell is going on when I watch it, but I know that I like it. 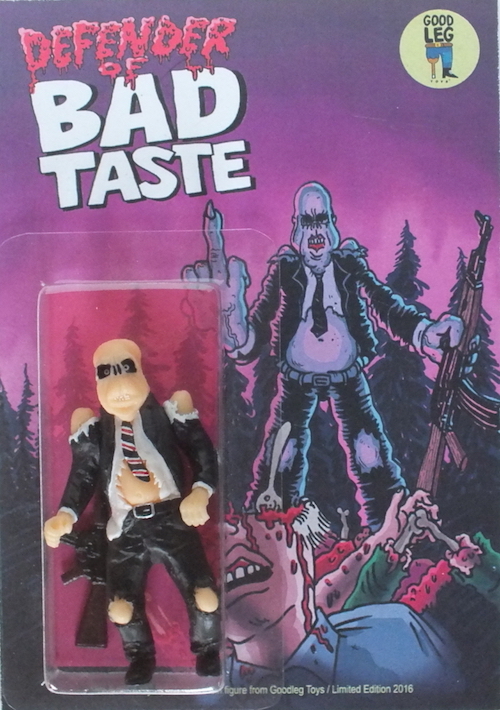 And now someone has actually made a Bad Taste action figure based on the character Lord Crumb! Yeah – that’s for real. Goodleg Toys just put these up today, so if you act quick you might still be able to grab one. Only 10 of the regular version were made (pictured above) and there were 5 ‘green border’ variants made as well with a different overall color. Obviously since there are only 15 total, these are rare and will make a great addition to your Bad Taste collectible roster. Not sure what that would consist of, but it’s a great addition nonetheless. The regular version is going for $65 and the variant is $70. Head on over HERE and see if there’s any left to pick up. And while you’re at it, go blow up a sheep with a rocket launcher.